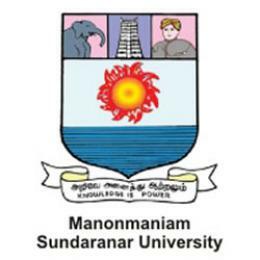 Manonmaniam Sundaranar University Distance Education 2019: Manonmaniam Sundarnar University was set up back in 1990 to satisfy the needs of a higher education institute in southernmost India, especially in 3 districts of Tamil Nadu, namely Tirunelveli, Tuticorin, and Kanyakumari. The university as of today has 61 affiliated colleges, 5 Mono Colleges, and 1 constituent College, with more than 65,000 students. There are 24 functional departments in the university receiving research projects from several funding agencies in India, Europe, USA, Japan, and UNO. Distance Education was started by the university in the year 1993. Prof. Dr. M. Soundarapandian (MBA, MA, M.Phil, M.Ed., Ph.D) is the director of DD&CE. He is a Professor of Rural and Industrial Management, and has completed over 27 years of teaching at PG level and 21 years of research experience. MBA General: Any undergraduate degree excluding B. Lit. Professional MBA: Any UG degree with minimum 2 years administrative experience as Gazetted officer, or equivalent. Bachelor of Library and Information Science: Any degree from any field. Master of Library and Information Science: Any degreefrom any field. Cost of Application for all the courses is Rs. 100 (if the prospectus is collected by hand), and Rs. 125 (if the prospectus has to be sent via demand draft). The last date to submit complete applications is June 30th every year (for calendar year admissions), and 31st December every year (for Academic Year Admissions).